This TI-30 ECO RS is almost identical with the TI-30 eco RS introduced already in 1999. The housing is still made of 100% recycled plastic which translates in Germany to: GEHÄUSE AUS 100% RECYCLETEM KUNSTSTOFF. Dismantling the latest TI-30 ECO RS is somewhat boring, we noticed a printed circuit board (PCB) known already from the previous models. Don't miss the TI-30 XA released in 2004, too. 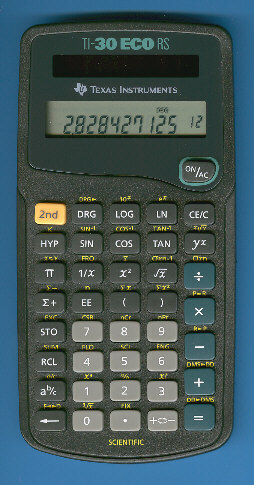 In 2009 the long lasting TI-30 ECO RS was revised and received a display with larger display. Don't miss the upgraded TI-30 ECO RS.